Pokebot is Pokeman Go Farm bot for Android devices. Due to the increasing popularity of Pokemon Go, developers have come up with the excellent Pokebot for this fantastic game. Every Pokemon Go gamer’s wish is to level up as swiftly as possible. The one way of leveling up fast is by playing the game, visting poke stops and catching Pokemon. You then transfer the Pokemon to the professor and earn candies. Lastly, evolve Pokemon and improve their CP and HP. You can do all this for a long time, months even years, which can be hard for gamers who don’t have the patience. Some may even quit along the way. It doesn’t have to be that way. That is where Pokebot comes in; it does almost all the work for you. Leveling up can be quick and fun when you decide to use Pokebot. It is like a robot that acts like your personal assistant, besides, who doesn’t like a little help? It will increase your experience and Pokemon CP. The most recent Pokemon Update blocks iOS Android Devices that have either been rooted or jailbroken. The blocking has been done to limit “cheating” using bots like Pokebot and scrapers. The gamer should be cautious to avoid bans from Niantic because the company has begun a crackdown on players who use bots, giving them permanent bans. The bans mean that you may lose your account for good. It identifies Pokemon Go gamers with rooted Android devices by using the Android Safety Net API, at least according to Reddit. Android SafetyNet API is a tamper detection layer designed by Google. Another measure Niantic uses is observing abnormal in-game activity. The new safeguards have been implemented to cut down instances of bots usage. What remains a mystery is whether those who play Pokemon Go cleanly but use jailbroken or rooted devices can be banned. Gamers can root or jailbreak their phones for other reasons other than using Pokebot. Pokebot is designed to run on your android device, just like many other applications do. It is not limited to a smartphone, it’ll also work on tablets. Pokebot’s primary purpose is leveling up in Pokemon Go without user input, it controls the gamers account by moving around, catching Pokemon, hatching eggs and visiting Pokestops just like the gamer would but saving them the physical exertion of walking around. The continuous playing gives trainers who use bots a distinct advantage regarding leveling up and even filling their Pokedex. You should be careful to avoid a ban by Niantic. To install Pokebot, first, ensure that your device has internet access. Download the bot from the below link and click on the downloaded file. Log in with your Pokebot Authentication token and validate with your Pokemon GO login credentials securely stored on your device. The next step involves adjusting the bots configuration to your preferred customization i.e. walking speed and coordinates. Configure what you intend to do, and by doing this, the bot will initiate communication with the Pokemon GO servers immediately. You will be able to Catch Pokemon, Spin Pokestops, and Incubate eggs. Pokebot’s main aim is to be as human-like and customizable as possible. The gamers can set a walking speed and a geographical location. Gamers or players can choose how they use their items to maximize XP growth. The items can be anything ranging from eggs to the Pokemon. • You can use the best Pokeball available. • Google/PTC Login- this means that apart from your Pokemon trainer club account, you can also use your Google Account. • You can search for Pokestops/gyms/spawns. • Free, easy to use for a newbie and also easy customization. • Farm all Pokemon in the neighborhood. • Throwing Berries/use best Pokeball. • Transfers duplicate or wrong Pokemon. • Catching and evolving all Pokemon. • Throws away unneeded/useless items. • Humanlike Walking by your character. • Soft ban bypass ensures no risk of soft ban. • Use lucky egg while evolving for the best EXP rate. 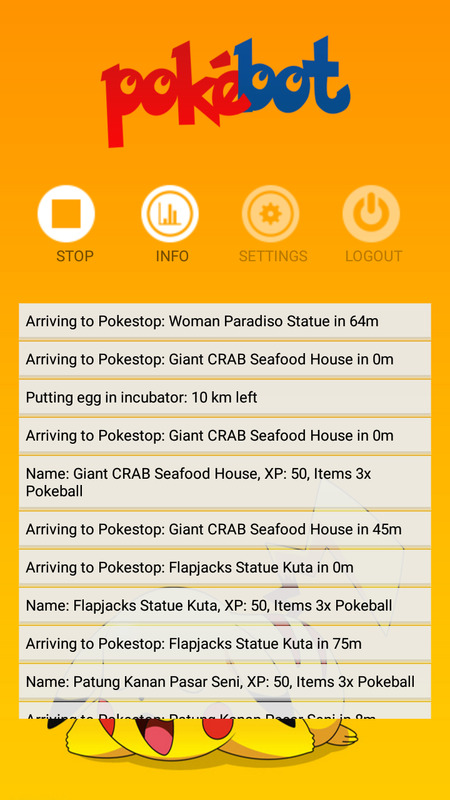 • Egg hatching automatically using incubators. • Power-Up or change the speed of your Pokemon character. Using Pokebot may sound like cheating but hey! Who doesn’t love to play dirty sometimes? What makes Pokemon Go so much fun is not just the game but how you play it. Pokebot removes much of tedious grinding from Pokemon Go. Niantic considers using Pokebot as a direct violation and breach of terms and conditions of service, and due to this, you should take precautions when using the bot. Apart from the company, other Pokemon Go users will be mad at you for the obvious cheating. They will see this as abuse for their hard work. It is important to bear this in mind when you decide to use Pokebot. 1.) You should avoid playing Pokemon Go while Pokebot is active at all times. 2.) Don’t pick the spawn point, not in your country. Changing geographic location is popularly referred to as GPS Spoofing. It allows the gamer to go to a different place in another country for capturing various critters. Niantic has recently been on the look-out for big jumps in player locations. 3.) For more XP, mark to spawn points as the most-visited places. 4.) The recommended speed is 25 km/h, anything faster than that may raise suspicions or unwanted attention that may turn to cost you. To download the most recent/up-to-date version of Pokebot us the download link below.